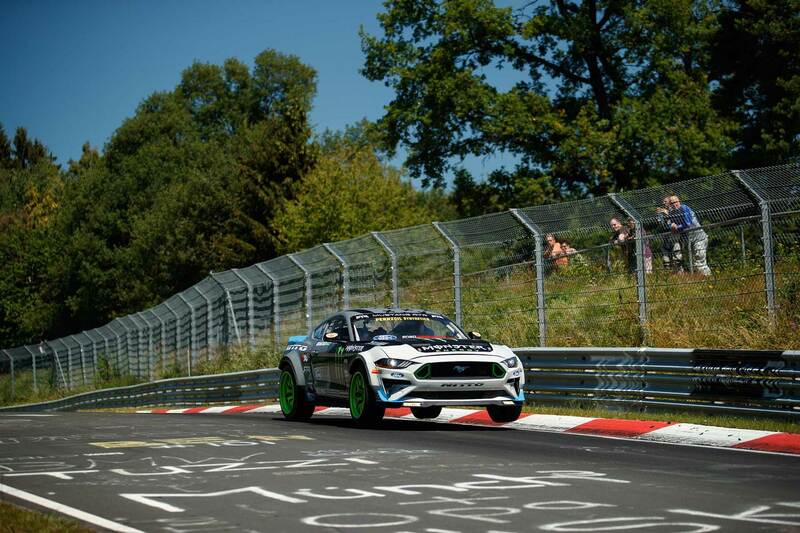 Professional drifter Vaughn Gittin Jr. is officially the first and only person to have drifted his way around the 12.9-mile Nordschleife circuit at the world-famous Nurburgring. The Formula D racer accomplished the jaw-dropping feat at the wheel of his 900-horsepower Ford Mustang RTR drift car. A video documenting the smoke-filled show is now live on YouTube and is appropriately named The Drift King of the Ring, which showcases Gittin Jr.'s extraordinary skills that he's sharpened over the course of a decade in the Formula Drift circuit. During every single mile of the nearly 13-mile lap, Gittin Jr. does all kinds of sideways stunts including dropping the rear tires off the tarmac, doing 360-degree drifts, and even kicking gravel on a nearby filming drone. "The Nordschleife is one of, if not, the most iconic track in the world and I have been in love with the danger and folklore of the famous Green Hell at the Nürburgring since I can remember," said Gittin Jr. “I finally went there in person in 2013 and it was then that I made a promise to myself that one day I would return to drift it in its entirety. Drifting the Nürburgring represents the ultimate challenge to me: it is something that many questioned whether it would be possible and whether the car and driver could do it and come out in one piece. Something inside of me had to take this on to find out. I didn’t go there for a lap time, I went for a good time!" According to Gittin Jr., this stunt was originally attempted last fall, but harsh weather in the area ruined his and the film crew's chances of filming a quality video. Interestingly enough, that's where the idea of drifting sections of the Nordschleife at the wheel of an F-150 Raptor was born. Approximately six months after the release of the Raptor video, it has garnished millions of views on YouTube and wowed truck and drift enthusiasts alike. As you can see in the photos above by famous automotive photographer Larry Chen; Gittin Jr. and his crew did get the job done this time, and needless to say, the results are simply spectacular. DeNofa and Gittin Jr. played with a pair of Mustangs at the recent Pennzoil 400 NASCAR race. And you can take one home real soon.